Your hands are the only parts of your body that touch the club and aiding them will help your game. Golfer’s are willing to spend a lot of money on golf shoes and hats and other accessories, yet often forget to invest in a great golf glove. Lose your grip on your game and you will soon lose control, so don’t hold back on getting a good glove. 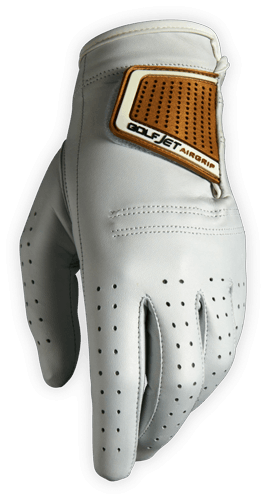 The AirGrip™ Glove by GolfJet is crafted from Premium Cabretta leather for the ultimate feel and control. A large silicon rubber strap helps enhance fit and comfort whilst moisture wicking perforations keep your hand drier for longer. The reinforced cuff adds durability and reduces wear.